Sometimes you just have to throw caution to the wind and splash out on something for you. That’s why I’ve just bought myself a new bean-to-cup coffee machine and I’m LOVING the fresh coffee it provides each morning. It wasn’t cheap – but it was worth the money. If you’re a coffee fanatic you won’t get fresher coffee even in a cafe! Over the last few weeks I’ve spent a lot of time researching coffee machines, especially on sites like BeanToCupCoffee.co.uk. I was confused about the difference between bean-to-cup machines and espresso…whether I needed a burr grinder or something else…and why some machines are cappuccino makers while others just do “milk frothing.” That’s why I’ve decided to write this post – to help you get fresh coffee without needing to get through the same painful research process. What is a bean-to-cup coffee machine? There are basically three types of coffee machine – filter, espresso and bean-to-cup. Filters make black coffee like you’d get in an a 70s cafe. Espresso machines can make – you guessed it – espresso but only from ground coffee. Bean to cup coffee machines can make coffee directly from the beans (the machines grind beans automatically). So why did I choose a bean to cup model? The simple reason is that I found out how much taste is lost when beans are ground. When you drink ground coffee, much of the oil has evaporated as it was only being protected by the bean. The longer time between grinding and brewing, the less tasty your coffee will be. That’s why a bean-to-cup machine is so great. Instead of using pre-ground coffee, it grinds new beans for EVERY coffee you make. That means there is very little time for the oils to evaporate and the coffee tastes much fresher. Do you need a cappuccino model? Some of the bean-to-cup machines I was looking at could automatically make cappuccino. For those who don’t know, this involves frothing milk and adding just the right amount to the coffee. I went for a middle ground – the machine I chose has a milk frother but it doesn’t do it automatically. I have to admit my first attempts at making a cappuccino weren’t great, but I think I’ve got the hang of it now! I’m thinking of starting a YouTube channel soon, and one of the first videos I’ll post is about the machine I bought (the Delonghi Esam). I’ve picked up some tips for making amazing coffee with it – I think you’ll enjoy it! It’s easy to get overwhelmed with house chores – especially when you have a million other things to think about. From getting the kids ready to school to making sure you’re at work on-time, it’s easy to let clutter pile up. The problem is that the gradually increased clutter can make your home less enjoyable to live in – not to mention frustrating when you need to find anything! If you’ve reached tipping point and are ready to declutter, here’s a quick 7-day guide to doing just that. Monday – I recommend starting your clutter with your digital devices. Start with your computer and laptop, and go through your main folders. Are they a mess? Have you got photos from 2007 in your My Documents folder? If so, organise everything into neat folders. If you haven’t already, you should also setup some sort of backup system in case of hard-drive failure. Tuesday – Sticking with the digital theme, the next step is to declutter your phone. Go through every contact and remove any you don’t need anymore. Delete unused apps. Move all your photos to your computer and then delete them from your phone. You’ll feel much better after you’ve done this, and your phone will probably run faster too. 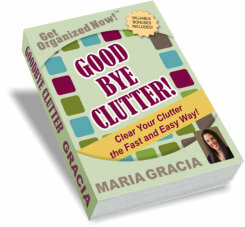 Wednesday – Now you can move away from digital to a physical location that often collects a lot of clutter: your car. If you’re like me, your car is probably filled with half-drunk diet coke cans and who-knows-what-else, so take a bin bag with you and chuck it all out. Take out anything else that doesn’t need to be in the car, then thoroughly vacuum. Thursday. Next, we have your clothes. I like to pull out EVERYTHING from my wardrobe and dresser and go through teach item one-by-one. If you haven’t worn an item in more than 12 months, it’s time to go! Make sure you donate anything that might be useful to someone else. Friday. If you have a home office, the end of the work week is a good time to declutter it. File any papers that you need to keep and throw away the rest. Organise your stationary and get rid of anything you don’t need. Saturday. The weekend is a good time to start tackling the big jobs. The kitchen is probably a good example. Start by going through your fridge and cupboards to get rid of any spices, food or other ingredients that’s either gone off or isn’t needed anymore. Then take a look at all your cutlery and crockery. What do you really use? Is there items that haven’t been taken out of the cupboard for years? If so, get rid of them. Sunday. The final day of the week is your chance to select an area of your home that really needs decluttering. It might be the bathroom, downstairs wardrobe or the TV cabinet – just make sure it’s something that’s been causing you stress. Go through every item and get rid of what you don’t need. After you’ve finished the week of decluttering, your home will feel MUCH more enjoyable to spend time in. Instead of wondering where everything is, most items should now have a designated place too. If this article helps you, please let me know in the comments! But I can’t complain – because I’m the type of person to let mess get worse…and worse…and worse…until eventually I snap and spend all weekend cleaning. Or at least that’s what I USED to do. Nowadays I like to think of myself as a more organised person, so I try to keep my home clutter free. This isn’t just because I prefer the way a clutter-free home looks, but also because I believe simplicity helps you to have a clear mind. It also reduces stress and just generally makes a home more enjoyable to live in. Don’t be afraid of a car boot sale. This might be a UK only tip, as I don’t know if other countries have car boot sales. But booking in a specific date for a sale, preferably with friends so you don’t feel tempted to back out, is a great way to get rid of a load of clutter AND make some money. Don’t try and clear everywhere at once. Like any chore, it’s best to do little bits at a time rather than trying to clear everywhere in a single day or weekend. I like to set a timer for 30 minutes and do as much as I can in that time. Once the timer goes off, I force myself to stop whatever I’m doing. Create a “not sure” pile. One of the hardest parts about decluttering is knowing which items to keep and which to throw away. Most of the time it’s a safe bet you’ll never need to use an item again if you haven’t used it within the last six months, but I have a box of items to “maybe” throw out. I then set a reminder on my to do list app for a few months time to go through the box. Schedule clothes decluttering sessions. The frequency depends on your shopping habits, but everyone tends to wear around 20% of their wardrobe while the rest sits in the cupboard gathering dust. Be ruthless about which clothes you’re not wearing and give them to charity. For expensive items, you might even be able to sell them on eBay. Don’t think about the cost of an item. Instead, think about whether you really need it NOW – regardless of cost. You can’t get that money back (unless you can get someone to buy it), so if you’ve wasted money on something you no longer need, don’t just keep it because you don’t want to feel like you’ve wated money. And as a final tip, make sure everyone in the house is onboard with your decluttering program. There’s nothing more annoying than going on a cleaning spree, only to realise that the house is still a mess because your house-mates or partner haven’t bothered to do their bit! What Makes Some Vacuums Quieter Than Others? Like most people, I HATE noise. I like my home to be a quiet haven of contemplation (kind of). So one thing I really hate is a loud vacuum. In fact, when I buy a new vacuum, the first thing I check is its decibel rating. Anything higher than 85dB and its a definite no-no. I was intrigued though – what makes one vacuum louder than another. And does a vacuum being quiet mean it’ll be less powerful? Here’s what I found. There are guidelines for how loud a vacuum should be in order to maintain comfortable noise levels, and it turns out that the recommended level is just 70dB. This surprised me, as most vacuums are considerably noisier than this. Dysons, for example, are known to be as loud as 90dB when used in high-power mode! And from looking at other brands, I would say that the average is around 80-85dB, which is a LOT louder. But this recommendation is real, at least in the US, as it helps to reduce noise pollution. So why are so many vacuums so noisy in comparison? My opinion is that most are just plain lazy. They know that most people won’t even consider the noise of a vacuum before they buy, so they cut corners and produce inefficient models. Come on vacuum manufacturers – get your act together! This is obvious, so I’ll be more specific. Most vacuums have a high speed fan, which creates a suction force at the centre and expulsion of air at the edges. There are variations on how different brands build their vacuums, but this is the basic idea. For cyclonic vacuums, such as Dysons, the dust is remove from air by centrifugal force. This requires that air is pushed rapidly, which creates additional noise. It’s my suspicion that this is why Dysons are ALWAYS so loud – they are all cyclonic. Of course, the motor also plays a big role in how loud a vacuum is – but it’s not uncommon to find that shifting between low and high power modes doesn’t change the noise output (although it usually does). It sometimes feels vacuum manufacturers don’t care about noise levels. It’s a common misconception that a louder vacuum must have more suction. It seems to make sense, right? But it’s not true. A vacuum can be built to be highly efficient, quiet and STILL have incredible suction. And a model so loud it bursts your ear drums can be poorly designed and have terrible suction. The bad news is that the quiet models are hard to find. I’ve found this list of the best silent vacuums though, and there looks to be some great models on there. You can also try searching Amazon, although there doesn’t seem to be a way to filter by noise level. Who Needs a Quiet Vacuum? For most people, it’s true that it doesn’t really matter how noisy your vacuum is. You probably only turn it on for an hour or so each week, so it’s not the end of the world if it’s overly noisy. But there are some people who REALLY need quieter appliances. I’m talking about people living in flats (you don’t want to annoy your neighbours), people who work anti-social hours so can only clean at night, people with children who wake easily, or people with a crazy dog (like me) who wants to kill anything that makes more than 70dB noise. If any of these sounds like you, I would seriously recommend looking at the noise level of your next vacuum. It’s such a relief when you can switch on a model and still have a conversation over the noise, compared to the ear blast you get from Dysons. There’s nothing better than sitting down with a relaxing cup of tea in-front of Bake Off – at least for the average Brit! Considering how much time we spend drinking tea though, most of us put very little thought into the kettle we buy. Most of us just pick the first one we see at Tesco, or the one that has the highest number of reviews on Amazon. While it’s true that most kettles “do the job,” at least when it comes to heating up water, there’s a great variety of features available on high-end kettles. And it goes without saying you need to pay a bit more if you want a stylish retro kettle! Type. Believe it or not, many people still use kettles heated on the stove. Known as stove-top kettles, these bring a stylish retro design to your kitchen that’s impossible to match with an electric model – and they also look GREAT. The downside is, of course, that they are much slower to boil (although usually more durable), but if you’re interested I recommend looking at buying a Wesco kettle. They are built with high-quality materials and have a beautiful whistle. Capacity. If you have a big family of tea drinkers, don’t get a tiny kettle. Simple as that. Boiling Quickness. The average Brit drinks 10,009 cups of tea per year (I just made that up, but you get the idea). What I’m trying to say is that we spend a LOT of time waiting for the kettle to boil. If you’re in a hurry, get a kettle that boils quickly – you’ll thank me later. Price. Another obvious thing to consider is the price of the kettle. I don’t want my tea to taste of plastic or take hours to boil, so I don’t mind spending a bit extra on a decent model. I recommend you do the same. Stove tops definitely aren’t for everyone, but if you’re into retro styling then they are a great choice for a kitchen. There is NOTHING worse than mould in a home. I would rather have mice in the kitchen than mould, because mice are easier to get rid of. Mould, once it sets in, is incredibly difficult to remove. The spores seep into the wall, especially if its damp, so it’ll come back again and again until you sort the underlying problem. And I haven’t even mentioned the health problems associated with mould. Ugh. That’s why I think it’s important everyone knows what mould needs to thrive, so you can starve it before it takes hold of your walls. Damp. Mould LOVES damp areas. The more moisture the better. If you dry your clothes inside, make sure you get a de-humidifier or at least keep the windows open a lot, otherwise you’re asking for mould down the back of the sofa. Food. Like anything else, mould needs food in order to thrive. There’s not much you can do about this though, as food is everywhere. Warmth. Hot, humid locations are best for mould. But if you already have mould, it’s not much help. Just removing the damp isn’t usually enough to get rid of it. Prevent condensation from building up – at least as much as you can. That means drying clothes outside, leaving windows open for short periods each morning, leaving doors open to help airflow, heating the home more and putting lids over saucepans when boiling water. There’s no point getting rid of mould until you’ve identified what’s causing the damp (you might need a professional to solve this). DO NOT try to get rid of mould if it covers a large area or if it’s caused by sewage – get someone who knows what they are doing. Wear goggles, gloves and a mask over your mouth and nose when cleaning ANY mould – you don’t want to inhale the spores. Use some washing up liquid in water and clean the affected area, then put the cloth into a plastic bag and throw it away immediately. Hopefully that helps you if you have a mould problem. It’s one of the things I hate the most in the home, but unfortunately I have some personal experience with it! My name is Abbie. I'm from the UK and LOVE interior design. I hope to be a professional one day - and this blog is my personal space for everything related to homes and decorating.